This story is written by Father Harry Winter, OMI and comes to us courtesy of the OMI US Province website. The passing of Nelson Mandela on Dec. 5 reminds Oblates that it took three great leaders to accomplish the abolition of apartheid in South Africa: Mandela, Hurley, and the Anglican Archbishop Desmond Tutu. Now is a good time to recall what Paddy Kearney wrote in 2009 in his well received biography of Hurley: Guardian of the Light, about Hurley and Mandela working together. 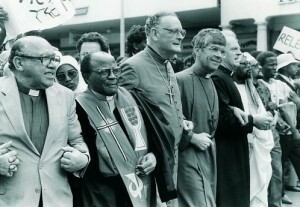 When Hurley was hauled before a court in February, 1985 and threatened with jail for publishing “untrue facts” in relation to action by police (p. 211), Mandela wrote from his prison: “Archbishop Hurley is often in my thoughts, especially now. I would like him to know that” (p. 223). The function of the Inauguration was magnificently performed, every person doing his or her part perfectly . . . The mood of the crowd rose to a joyous fever pitch. The final act was the firing of a twenty-one-gun salute and a flyover in tight formation of several SAAF squadrons, the last one consisting of six planes that left trails in the many colours of the South African flag. The crowd was ecstatic. ‘Our air force’, shouted the African citizens . . . Lunch followed, very well organized—plenty of food and drink, easy access to supplies and to tables. And by 3:00 p.m. we were climbing onto buses and heading for the airport full of the joy of having participated in perhaps the greatest day in the history of South Africa. When Brother Jude Pieterse saw Hurley after the inauguration, he noticed ‘an excitement I had never really associated with him before . . . He was almost . . .bubbling over, you know. Normally he kept his emotions pretty well under control, but [that day] there was a real joy in his whole approach’. “(p. 306). In 1999, President Mandela conferred on Hurley the Order of Meritorious Service (Class 1) (p. 309). When Hurley died on Feb. 13, 2005, Dominican Sister Marie-Henry Keane, who as a young nun had benefited from his special attention in explaining Vatican II to women religious, called him “the Nelson Mandela of the Church” (p. 325). Now they are together, rejoicing at the continued growth of justice, truth and opportunity in South Africa. South African President, Jacob Zuma visited Durban’s Emmanuel Cathedral on 19 April to pay tribute to Archbishop Denis Hurley’s contribution to South Africa’s liberation struggle by laying a wreath on his tomb. This was part of a national program of visits throughout South Africa to mark the centenary of the ANC’s foundation. The brief ceremony at the Cathedral began with Cardinal Wilfrid Napier, OFM, and other religious leaders greeting the President and his party at the entrance to the Cathedral and then escorting them to the Archbishop’s tomb in the Lady Chapel.